« Why Are We Paying $100 Million to International Bureaucrats in Paris so They Can Endorse Obama’s Statist Agenda? I don’t know if this is true, but it’s been circulating for so long that there’s probably some fire under all the smoke. Does anybody know if this is for real, or an urban legend? Hey, that gives me an idea how to solve the fight over private businesses being forced to participate in gay marriages. Why don’t we just declare that gay marriage is such a fundamental human right that it is unacceptable to trust it to greedy and corrupt private businesses. Create a Federal Department of Gay Marriage, and pass a law that only duly authorized federal agents may perform gay marriages, at fees to be set by the state — so that they are not subject to capitalist manipulation. And besides, no one should be allowed to profit from True Love. Put people who weren’t efficient enough for the VA or the motor vehicle bureau in charge. Not only would this spare private businesses from being forced to perform a gay marriage in conflict with their religious or moral beliefs, but I think we’d quickly find that people would be paying outrageous fees and would have to wait for years. Then we can talk about nationalizing Planned Parenthood. 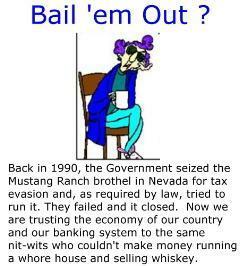 on September 27, 2010 at 5:50 pm Sean L.
Hmm… Just how would it have been for a brothel to be government-run? Hookers would unionize and join the SEIU. Then they would demand official break times, minimum guaranteed wages and exclusions from certain … acts. They would then petition the government for subsidies for poor and handicapped johns, which would drive up prices for the rest of us.. uh, I mean everyone else. Then they would take the money from the subsidies, buy lobbyists who would donate the cash (and services) to congressmen who would make street-walking a federal crime punishable by 20 years in prison, thereby destroying their competition. The SEIU would move state governments to eliminate infidelity via prostitute as a mitigating factor in divorces. By 2020, there would be a Cato report showing how our hookers cost 180% more in real 2010 dollars than European hookers, with no measurable signs of improved performance. on September 27, 2010 at 4:36 pm Steve P.
According to snopes.com, this is only partly true. The IRS seized the brothel for non-payment of taxes, then resold it to A.G.E. Corp.
No, I have no doubt that would not have happened. Government agencies that fail don’t get shut down and sold. @Mark but do you really have any doubt that they would’ve messed that up too? No, it is an urban legend: http://urbanlegends.about.com/od/government/a/mustang_ranch.htm . The government planned on it, but the bankruptcy judge didn’t think they were qualified.